Supreme Court nominee Brett Kavanaugh leaves a meeting with Senate Majority Leader Mitch McConnell, R-Ky., on Capitol Hill, July 11, 2018. A partisan divide over U.S. Supreme Court nominee Brett Kavanaugh deepened Wednesday, with Republican senators extolling his judicial record while Democrats demanded time to thoroughly vet his writings and opinions on matters ranging from environmental regulation to executive authority. "Judge Kavanaugh is the real deal," Majority Leader Mitch McConnell, a Kentucky Republican, said one day after a closed-door meeting with the nominee. "He has the all-star legal resume, top-flight academic credentials. His extensive judicial record is defined by fairness, thoughtfulness, thoroughness and analytical precision." President Donald Trump nominated Kavanaugh, 53, on Monday, making his second high court pick in as many years. 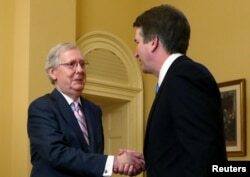 FILE - U.S. Senate Majority Leader Mitch McConnell greets Supreme Court nominee judge Brett Kavanaugh on Capitol Hill in Washington, July 10, 2018. An appellate judge since 2006, Kavanaugh took part in investigations of former President Bill Clinton, helped former President George W. Bush prevail in the 2000 Florida vote recount battle, and served in the Bush administration before Bush nominated him to the federal bench. If confirmed, he would replace retiring Supreme Court Justice Anthony Kennedy, for whom Kavanaugh once clerked. While Republicans reaffirmed their intention to process the nomination well ahead of the November midterm elections, Democrats argued Kavanaugh's record deserves painstaking scrutiny that must not be rushed. "Judge Kavanaugh has written some troubling things about environmental protections, consumer protections, commonsense gun safety laws — all of which should be carefully examined by this Senate and by the American people," Minority Leader Chuck Schumer said. FILE - Sen. Charles Schumer, D-N.Y., meets with Brett Kavanaugh, right, then-nominee for the D.C. Circuit Court, on Capitol Hill, May 2, 2006. In addition, the New York Democrat said, the nominee's writings reveal an expansive view of presidential authority that is ominous in the Trump era. "Judge Kavanaugh argued that a president should not be subject to an investigation while in office, that a president should be above criminal and civil indictments," Schumer said. "Those are serious and dangerous beliefs." Republicans who met with the nominee Wednesday expressed no such concerns. 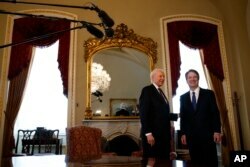 Supreme Court nominee Brett Kavanaugh, right, meets with Sen. Orrin Hatch, R-Utah, on Capitol Hill, July 11, 2018. "He's absolutely honest and straight forward, and I think he'll make an excellent Justice on the United States Supreme Court," said Orrin Hatch of Utah, a long-serving Senate Judiciary Committee member. "I expect his confirmation to go well. There'll be the usual attempts to sully his reputation not only in the Senate but outside of the Senate, but … I have every confidence that this man is going to be confirmed, as he well should be." Republicans hold a slim, one-seat Senate majority, and a party-line vote would lead to Kavanaugh's confirmation by the narrowest of margins. Democrats hope two Republicans who back abortion rights, Susan Collins of Maine and Lisa Murkowski of Alaska, will vote against the nominee. Republicans, meanwhile, hope centrist Democrats running for re-election in conservative-leaning states will back Kavanaugh. Three Democrats voted for Trump's first Supreme Court nominee, Neil Gorsuch, last year.